I had the pleasure of receiving a wonderful baby changing bag recently from a brand called Yippy Dada. I only wish i had discovered these wonderful bags 2 years ago when i had first given birth to Neo. You see, as a girly girl i do like a nice bag. I like it to be striking and beautiful but also able to hold the two tons of crap that i carry around with me on any given day. On the days i have Neo with me also, times the crap tonnage by two. Even though we are out of the bottles and baby food stage, he still needs a fair bit. This boy goes through sooo many nappies and juice. We always carry spare clothes and we always have a good few toys, wet wipes and other toddler paraphernalia on hand too. So a good bag is essential to me as a lady and a mama! When i first had Neo i bought myself a basic nappy changing bag, but then didn’t really love it so i just opted for bigger normal bags and kinda muddled on through. The amount of times in a sleep deprived state i thought i’d lost my keys/purse/phone in the big old bags, it was pretty bad! The Yippy Dada makes things soooo much easier,with lots of compartments and sections and even a detachable key chain to attach your keys on to whilst they are in your bag (which in my eyes is genius!) this makes outtings with babies MUCH easier. Since receiving the Yippy Dada bag i haven’t stopped using it! Even on the days i’m without Neo i have been taking it out with me as it is just such a great size and so well organised. 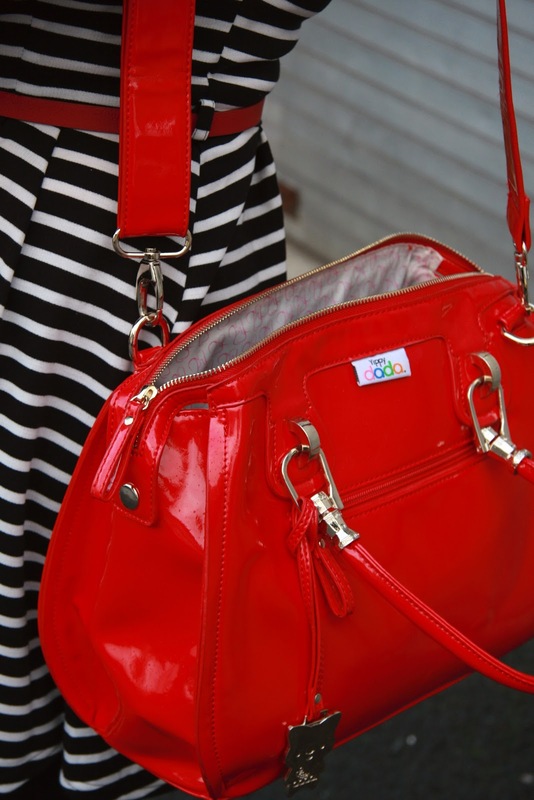 I choose the red as it goes with my personal taste and most of my outfits! But i also love their Highlander satchel and this funky Buttercup bag! The bags come beautifully presented in a Yippy Dada box and each bag comes with a dust bag too. 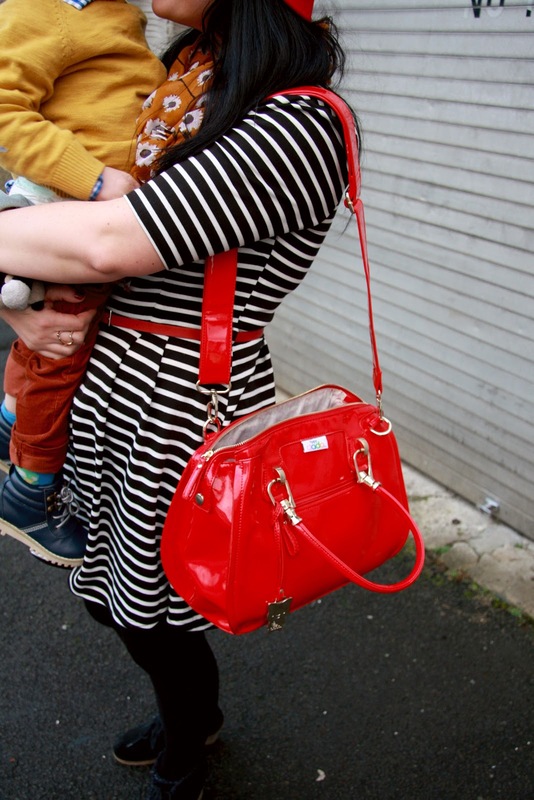 I was stunned by the superb quality of the bag and i have to say, even as Neo grows out of nappies in the next 6 months i will still be using this bag as we potty train him and long after that! 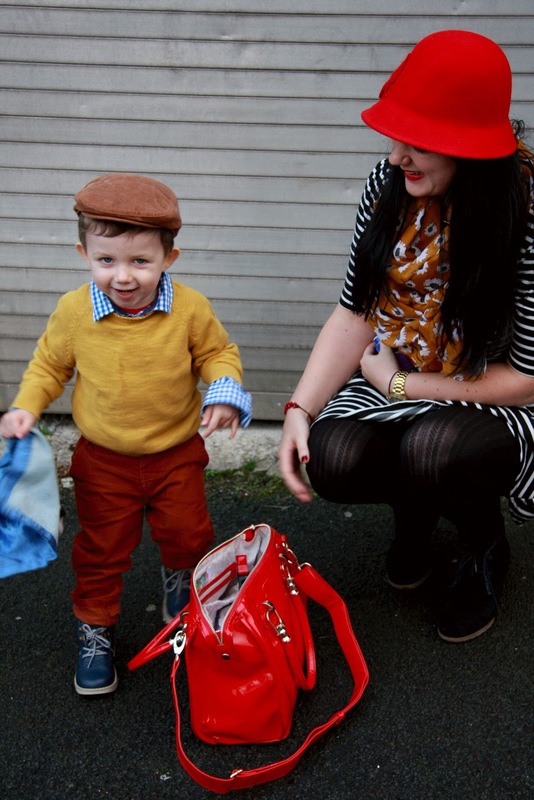 The lovely people at Yippy Dada are giving Rachel The Hat readers the opportunity to win one of the fabulous bags! Not a mama, but know someone who is or expecting, well what a superb gift this could be for them? Simple right? Thats 3 entries per person. Please leave a separate comment for each to be included as a vote! oh my goodness you two are too precious! 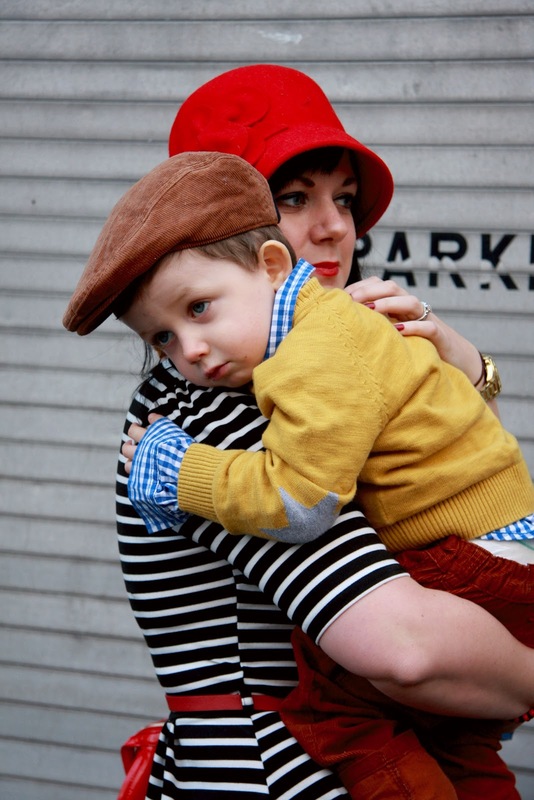 Your outfit is perfect w/ that hat & you've dressed your little one so darling! I hope it was ok to comment w/out entering the giveaway, I'll leave the giveaway to the mama's! Love the Kitty changing bag. Also love your glam red one 🙂 New baby due in Feb so please! I really like Bella Changing bag in black and the Foxy Leather bag.. The Cheeky Pink one is cute too!! I would definitely give this bag as a gift! New moms need all the help they can get, right? Love the one you chose Rachel! I often go for bright red as well.. I think I'd pick the daisy/floral one.. oh damn, pregnancy brain, I've forgotten the full name!!! My dear… where have i been! As often as I check out your blog, I didn't even know about Ne! How adorable is he!! I love his hat, it brings back such memories for me! All three of my children were raised wearing hats! We were known as the hat family. Kudos to your gorgeous selves! Well done product review! Had this wonderful product been around in my day, I would be ordering one right now after such a glowing product review by such an uber stylish mum!! I already fangirled over you and Neo on Instagram, but what cuties you both are! And now that I've had a proper look, Caelen has the same jumper as him 🙂 Next has some gorgeous stuff for kids, don't they?! 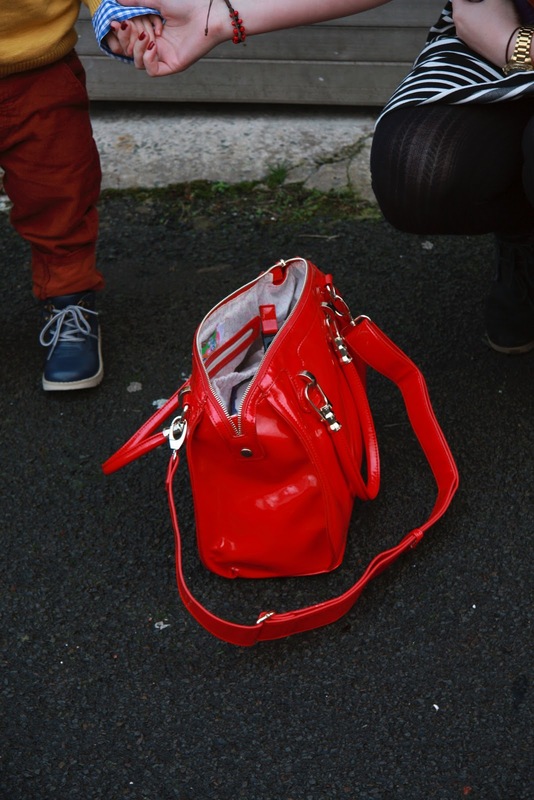 I've pored over the bags like nobodies business, but the red Bella is perfection itself. And it matches my pram and buggy better than my current hand-me-down changing bag! I'm a follower of your blog through GFC, and I've followed Yippydada on Facebook and Twitter. I'll have my fingers crossed for the week! That bag is gorgeous. Who would ever guess it's a nappy bag. I love the brown Foxy leather bag. I follow via GFC. Ooh, lots of cute bags. I love your red bag, and I love the Sea Breeze one as well. 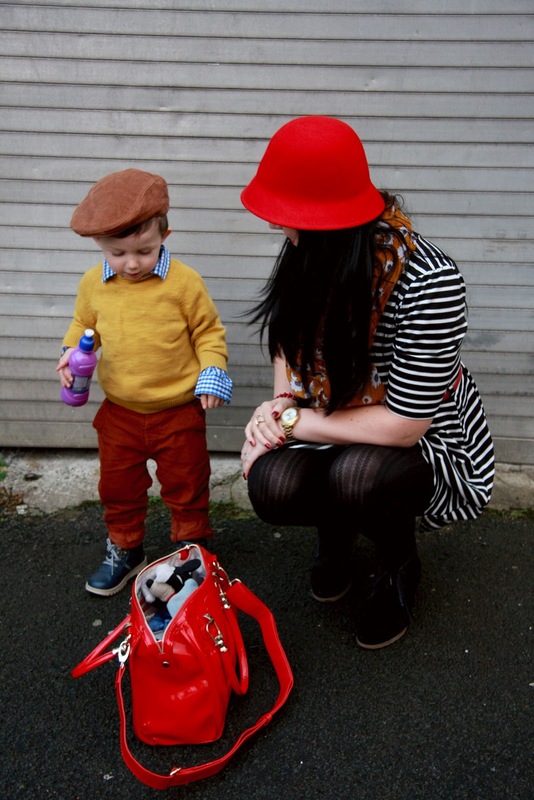 I'm a new mum to a six week old and I love finding blogs of glamorous mums! I'm nowhere near that yet, but it gives me something to aspire to! As to my favourite bag, I like the one you have. It matches my favourite lipstick! My fave bag is definitely the Real Leather brown – It looks like a very chic purse! Love the bright red color! Great choice. I love the ella Baby Changing Bag (Black). It would go with anything. Loving your sons hat. He is sooo cute. What a lovely diaper bag!! I would love to carry that around. I love your hat as well…you wear them well :). I liked them on fbook/. I follow them on Twitter now! ps. forgot to mention… I am liking the Highlander bag. I'm following YippiDada on Twitter as @MyMillsBaby (I'm following you on BlogLovin) – finally – isn't your little boy the CUTEST around????? What a gorgeous bag! You're rockin' it lady!